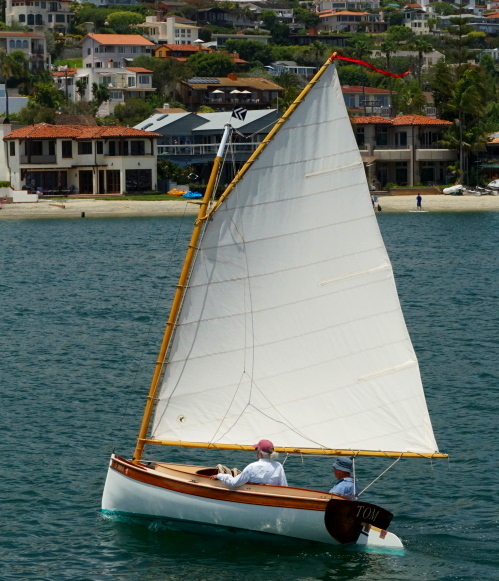 A customer in San Francisco who designed and built a 20-ft gaff rigged traditional boat (“more or less like a Herreshoff 12 ½, but longer”), included in his priorities for the sails “strong corners”. He further explained that his goal for the rig is to use modern materials while maintaining a traditional look. So, we offered 5 oz tanbark cloth, crosscut with narrow panels, boltropes with ducktails, and traditional corner patches, BUT with Bainbridge Inox hydraulic-pressed rings (instead of brass spur grommets or hand-sewn rings) for corners and the reefs. We used these routinely on the big sails we made during Dabbler Sails early years. Since retreating to smaller traditional sails the inventory of various size rings, and the expensive dies used to set them, has tended to collect dust. They are, however, just the ticket for this customer’s 163 sq ft gaff main, destined for use on windy San Francisco Bay. We would have used them even if the brief had not included “strong corners.” Our home-made press is hung on the wall at eye level, which facilitates scrutinizing the operation as the liner flares out and squeezes the two halves together. The handle in the 22-ton jack is for 7/8” and 5/8” rings. The longer handle hanging on the wall is necessary for 1” and 1 3/8”rings. See below for Inox ring anatomy. Inox rings from Bainbridge have been our standard hydraulic pressed system since we started in 1991. Here are the components – a pair of injection molded nylon rings, one with passivated stainless steel needles, and a tubular stainless liner, which is flared in the dies to press the liners together. The needles penetrate the multi-layered patch and enter the plain ring opposite, creating a double shear load on the needles. The 7/8” ring in the peak of our 5 oz gaff sail has two dozen of these tiny needles. When introduced three decades ago hydraulic pressed rings quickly replaced the traditional and time consuming art of hand sewing corner rings. Several sailmakers have tested the relative strength of pressed rings against hand-sewn ones, with inconclusive results – sometimes high tech wins the tug of war, sometimes the artful HSR. We chose high tech for this sail partly for predictability, partly for economy (8 HSR’s @ $50.00 each compared to 8 Inox rings @ about $10.00 each). The new owner of this lovely 15-foot wherry, designed by Bud Macintosh and built 40-odd years ago by his apprentice Jeff Fogman, contacted us with a brief for a new gaff main and jib: “I have the original cotton sails, which are beat but intact. I’d like sails that look right with the traditional build (cedar on oak, linseed oil/pine tar interior), but modern/durable and reasonably efficient.” We settled on 5 oz Contender cream, a very soft polyester, vertical cut with 18” panels, ¼” boltropes (we agreed not to imitate the originals' hand-sewn and rat-tailed boltropes), and hand-sewn brass rings w/brass liners for the corners and reefs in the main, as in the cotton suit. See below. Here’s the clew of the jib for the wherry above. There will be 11 rings in the wherry sails, 3 in the jib and 8 in the main. We will use No. 5 and No. 7 (5/8” ID and 1” ID) brass rings and brass liners, the appropriate sizes for most of the small craft sails we make. This is a No. 7; the 5's will be for the two reefs in the main. We don’t get a lot of commissions calling for this kind of palm-and-needle work, so we couldn’t produce a good result without cheating a little. Instead of plunging away freehand, we make a pattern of needle holes with a template, and pre-punch them on the sailmaker’s log with an awl and mallet. Then it's just stitch and heave, stitch and heave. The first roller furling jib made in our loft was for the Dabbler, an 18' Marshall catboat my wife and I bought when we settled ashore after years of live-aboard cruising. We converted her to a yawl and added a bowsprit to carry a jib. The long ‘sprit dictated a furling jib. There were several foil systems available for small boats, but we decided to try an adaptation of the water generator we had towed on offshore passages: A small outboard prop on a few feet of ¾ “ shafting, shackled to a length of 5/8” Dacron double braid, shackled in turn to a DC generator hung on the stern "pushpit". The drag of the propeller put enough tension on the rope to turn it into a rigid driveshaft! The amps of 12-volt current generated at normal sailing speeds made ice and froze food in our tiny fridge. So the Dabbler's jib was made with an ordinary Dacron double-braid luff rope ending in thimbles. A second-hand furling drum and upper swivel completed the installation. We added a purchase to the jib halyard to get the needed tension. It worked perfectly, and we duplicated it when we rigged a bigger catboat with a jib. (See "The Company Boat" page on this site). Soon we were persuading customers to use furling on rope instead of the 1x19 wire which was common for small boat furling jibs back then. Rope’s larger diameter furls up the sail quicker. Rope will be stronger than the wire called for on many small craft designs. The tiny extra stretch is irrelevant on the typical traditional rig, which often has an unstayed mast anyway. Multi-thousand-dollar “torsion rope” furlers for big-boat free-flying gennakers have since appeared on the market – braided stainless-steel wire filaments over braided polyester core. A low-tech Dabbler Sails "rope furler" costs the same as a regular hank-on jib. Photo shows tack of a furling-on-rope jib (with suncover). The welded stainless ring has been added to fit between the drum and swivel jaws of popular small furling units. We made this 85 sq ft boomless lug sail late last year for adventurer and author (Jagular Goes Everywhere) Tom Pamperin. He recently finished his new boat, an 18’ “Alaska” beach cruiser designed by Don Kurylko, and took a short trial cruise. (The design calls for a ketch rig, but Tom elected to start with just the main in an alternate step.) This rig is a big jump up from the Jagular, a flat-bottom skiff home built with cheap plywood, a 2 x 4 for a mast, closet rod for a boom, and a sail made out of a plastic tarp. Alaska was specifically designed for long-distance cruising under sail and oar, and is a serious piece of boatbuilding. The lugs’l is 5 oz cream Dacron, with one more reef than shown on the plans. Because the sail is used without a boom, there will be considerable strain on the new foot for each reef, thus the continuous reef bands instead of individual reef point patches. When we saw this photo, we suggested the possibility of a vinyl window so Tom can see where he's going (he replied he has raised the sail a little and can peek under it), and mentioned the idea of brailing, to make way for rowing in a calm without dropping the sail. We didn’t always make sails like we do today. The most recent one, number 1,315, has been folded to display some of the ways current production differs from what we produced when we opened our loft in 1991. 1) Three-strand spun Dacron boltrope, sewn to tabling heat cut by hand from the same, or similar, cloth. 2) Boltrope carried around corners and ended with a trick we have dubbed “ducktailing”. 3) Reef points of soft braided nylon, finished with a seizing of sail twine instead of the hot knife. This one is close to the leech to help tidy up the bunt there. 4) Clew trimmed with hand-stitched leather. 5) Our logo, silk screened in the shop and machine sewn to the sail. 6) Colored 4 1/2-foot pennant to fly at peak of four-sided sails. 7) Webbed-in brass ring to suit sprit tip when sail is a sprits’l. Like most of our small-craft sails, this one is fitted with traditional corner patches. Hand-set brass spur grommets are used throughout. Wow! 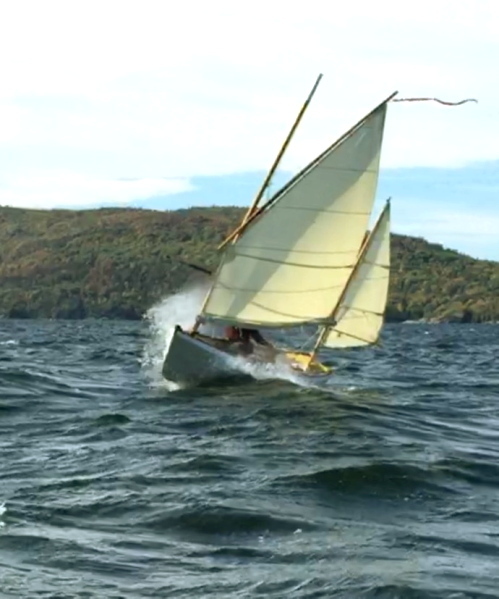 Double reefed in force 5, and making to windward against a lumpy chop on Lake Champlain. Hats off to Dr. John Hartman for having his Francois Vivier Ilur ”Waxwing” perfectly set up for the conditions. Hats off to the designer for drawing such a powerful, seaworthy row-sail beach cruiser. Hats off to the skipper of an Iain Oughtred Ness Yawl who snatched this frame out of a video he shot, catching the precise moment the hull destroys that wave -- you can almost hear the “Pow!” Modesty forbids the sailmaker from doffing his hat to himself, but he confesses feeling lucky that Dr. John, Monsieur Viver, and the videographer have conspired to make his sails look pretty good. They are deployed and trimmed beautifully, and that double-reefed main looks very tidy, no dribs and drabs sticking out here and there. 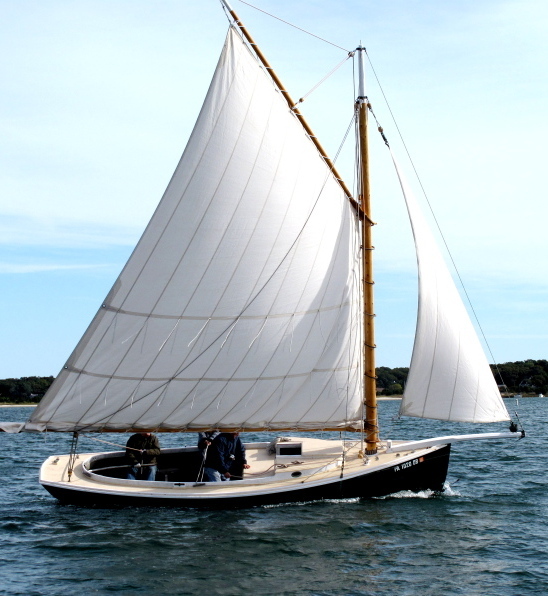 Although only 14' 8" long, the little yawl has a very generous sail area of 134 sq ft. Plenty for light airs, you might think, but in fact the Waxwing’s skipper recently commissioned a bit of spinnaker cloth to bring the total to 174 sq ft. See below. A few years ago we made the lug main and mizzen for "Waxwing," the Francois Vivier designed ILUR seen above, and since then she has done quite a bit of sailing in Vermont and on the coast of Main, frequently encountering very light winds. 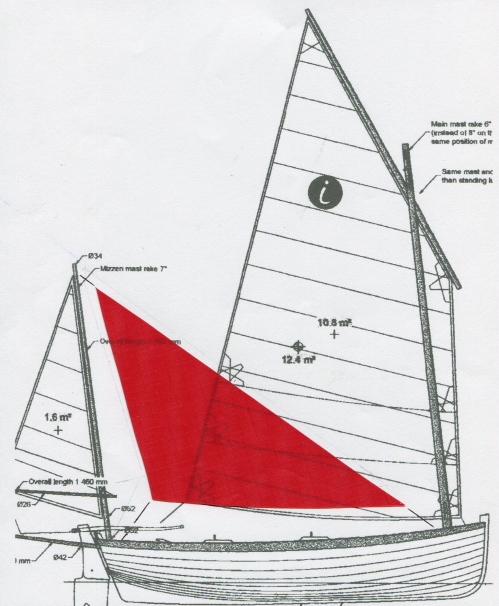 Because the ILUR is a row-or-sail boat (no outboard clamped on the transom), the owner imagined more sail area, in the form of a handy, easy to set and strike mizzen staysail, and queried us for an opinion. As it happens all of our personal boats have had mizzen stays’ls -- a 30 ft ketch, a 40 ft cat ketch, and two catboats converted to yawls – sails we deployed whenever the occasion presented. We agreed such a sail might prove particularly useful on a row/sail beach cruiser like the ILUR – might often make the difference between having to row for the next campsite or not. On receipt of a few measurements, we drew a 40 sq ft sail to be tacked on the weather rail forward and sheeted to the leeward rail aft. We cut it rather flat from 3-oz polyester (instead of nylon) “storm spinnaker” cloth, in the hope it will prove useful even with the wind a little forward of the beam, and keep its shape in slightly stronger winds. West Coast naval architect William Garden designed this 12-ft Tom Cat catboat for his own use, basing her on the general aspects of the popular East Coast Beetle Cat class. WoodenBoat Magazine featured her in 2004, and several have been built since. Last year we made the 120 sq ft sail for two California customers, both of whom chose 7 oz Oceanus Ship’s cloth, with custom handwork – rat-tailed boltropes and hand sewn rings. This one, undergoing sea trials near San Diego, has no reef, usually considered obligatory for gaff cats, because the client wanted the purity of a sail without one. (He may be counting on scandalizing the gaff if overblown.) The other California boat will be sailing near Los Angeles. Early in 2016 we delivered a third Tom Cat sail to a Long Island, N.Y. client. Based on day sailing in Long Island Sound's usually light summer winds, he chose 4 oz cream cloth from Contender Sailcloth, but specified TWO reefs instead of the single reef shown on Garden’s plan. Different strokes . . .
Here’s Dabbler Sails' new style for terminating boltropes. While making sails for a Nathaniel Herreshoff Coquina we struck a compromise on one of the important aspects of sailmaking – what to do with the boltrope when it ends at the head, tack or clew: A compromise between cost-effective utility and the time-consuming process of rat-tailing -- separating the boltrope strands into yarns, tapering and waxing them, twisting them back into strands, then those into rope, finally hand-sewing the rat-tailed bolt rope to the sail. (See an example of that on the Appendices page of this 'site. We still like to do it when the client chooses.) Our new technique looks like a practical alternative to the traditional elegant, but expensive, handwork: Around the corner for strength, with what we have dubbed a “duck tail” instead of a rat tail. For full disclosure, see below. To "ducktail" a boltrope, the tabling with it's machine sewn rope is sewn around the corner (head, tack, or clew) and a little beyond. A few inches of rope has been left unsewn to the tabling, and now it's three strands have been separated and sheared off at staggered lengths. A simple patch, heat cut from a scrap of cloth, is folded over the cut strands and sewn in place. The corner ring, whether a spur grommet, hydraulic pressed ring, or hand-sewn ring, will be trapped inside the boltrope, a better looking and stronger arrangement than the nearly universal method of truncating the rope before it reaches the corner; a method that works only because of the great strength of modern sailcloth, but which leaves corners subject to distortion and occasional failure under heavy load.